Another essential fundamental for 21st century entrepreneurial success is a community’s ability to support and further innovation across a range of sectors. Edmonton excels in this endeavour with its extensive research and development (R&D) infrastructure, appetite for excellence and a strong, and growing, network of partnerships aimed at exploring new approaches and developing new technologies. The Government of Alberta actively and directly supports a full range of research. The initiatives focus on solving key industry issues using innovation – including new product development and commercialization – to develop practical solutions. Alberta Innovates - Technology Futures provides technical services and funding support to facilitate the commercialization of technologies and to develop new knowledge-based industry clusters. Through these programs and facilities, Tech Futures enhances the ability for a researcher or entrepreneur to evolve an idea to a market-ready product. The following examples illustrate the partnership approach that helps industry to be more competitive. MARIOS (Materials and Reliability in Oil Sands) links oil sands producers, materials and equipment suppliers, fabricators and technology providers to solve industry-wide problems collaboratively. AMFI (Alberta Metal Fab Innovation) is a unique company development opportunity designed specifically for the Alberta metal manufacturing sector. Participants gain access to both production and business enhancement expertise developed and provided by some of Alberta’s top research, technology development and process improvement institutions. With over 450 scientists, engineers and technicians, Natural Resources Canada's CanmetENERGY is the Canadian leader in clean energy research and technology development. The CanmetENERGY research facility, near Edmonton, employs about 130 scientists, engineers, technologists and other staff to focus on critical oil sands environmental issues while also ensuring it remains a valuable product for Canada. Scientists and researchers are leaders in developing new analytical methodologies to fulfil industry’s demands for better and detailed compositional information on highly complicated hydrocarbons. More than 1,500 people work for more than 50 companies at the ERP, engaged in advanced research in medicine, biotechnology, software, petroleum research, cold climate engineering, nanotechnology and clean energy. 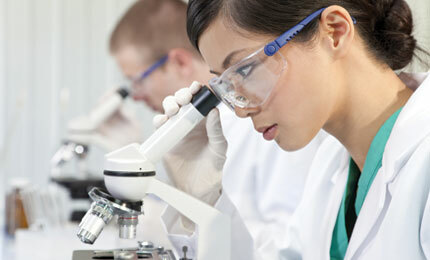 Sites are also available for larger companies to build their own research and development facilities. Refer to Edmonton Economic Development Corporation for more information. NAIT’s extensive research activity directly supports industry – in a range of ways from the application of new technologies to productivity enhancements. The NAIT Shell Manufacturing Centre (NSMC), the first facility of its kind in Canada to link productivity enhancement services with manufacturing solutions, helps Alberta’s manufacturing industries become globally competitive by providing productivity solutions. These solutions use both time-tested and innovative technology, manufacturing expertise and practical education. The National Institute for Nanotechnology (NINT) is an integrated, multi-disciplinary institution involving researchers in physics, chemistry, engineering, biology, informatics, pharmacy and medicine. Established in 2001, it is operated as a partnership between the National Research Council and the University of Alberta. NINT researchers are focused on the revolutionary work being done at the nano-scale, the world of individual atoms or molecules. NINT is located on the University of Alberta campus in one of the world's most technologically advanced research facilities. It houses the quietest laboratory space in Canada. With the goal of helping Alberta businesses boost their productivity, Productivity Alberta, a not-for-profit corporation, offers a range of services to help business compete more effectively within the global marketplace. Productivity Alberta works in the industrial products and services sectors to improve not only single businesses, but supply chains from top to bottom. Productivity Alberta’s approach has gained international attention for its approach to engaging industry. The University of Alberta, one of Canada's top institutions in energy and environmental research, plays a major role both in supporting Canada's energy sector and in sustaining our environment. The Faculty of Engineering, with more than 200 professors, 4,000 undergraduate and 1,600 graduate students, is a vibrant research community that attracts more than $50 million annually in sponsored research funding from external sources. The Institute for Oil Sands Innovation (IOSI) partners with industry to develop breakthrough technologies that will allow Alberta to efficiently and sustainably develop Alberta's oil sands. The Centre for Earth Observation Sciences (CEOS) has established partnerships with Syncrude and Suncor Energy and focuses on hyper-spectral characterization of oil sands. The Alberta Centre for Surface Engineering and Science (ACSES) investigates surface characterization and modification. This includes reducing waste from oil sands extraction. The Centre for Intelligent Mining Systems (CIMS) works on exploratory research in intelligent systems for the oil sands mining industry that integrates sensing with automated reasoning and human interaction. The Oil Sands Tailing Research Facility (OSTRF) investigates ways to handle oil sands tailings. The goal is to be able to return to a stable landscape directly following mining. The Centre for Applied Business Research in Energy and the Environment (CABREE) provides applied economic analysis to inform public policy debates on issues of vital importance to Alberta and Canada. Research efforts focus on energy markets, electricity restructuring and climate change issues. The Canadian Centre for Clean Coal/Carbon and Mineral Processing Technologies (C5MPT) is a research and education centre that supports sustainable and responsible energy and mineral development. The Oil Sands Research and Information Network (OSRIN) is an independent organization that is the destination of choice for those seeking reliable information related to environmental management of oil sands mining and processing. The Alberta Biodiversity Monitoring Institute (ABMI) conducts world-class biodiversity monitoring of more than 2,000 species and habitats to support decision-making with scientific knowledge about provincial biodiversity. The Canadian Building Energy End-Use Data and Analysis is a research unit dedicated to improving knowledge and accessibility of building energy data for the Canadian residential, commercial and institutional sectors. Canadian Circumpolar Institute promotes and supports northern and polar research. The Helmholtz-Alberta Initiative is an independent, international research partnership designed to find solutions to environmental issues facing energy projects.